CAMBRIDGE, UK – Feb. 20, 2008 – ARM [(LSE:ARM)]; (Nasdaq:ARMHY)] today announced at the Game Developers’ Conference, San Francisco, Calif., the ARM® Mali-JSR297™ software for 3D graphics, the first product to enable developers of Java applications to take advantage of the latest hardware graphics features found in OpenGL ES 2.0 graphics processing units (GPUs), such as the ARM Mali200™ GPU. With the established Mali-JSR184 software (formerly Swerve Client), ARM is uniquely positioned to offer a complete software and hardware graphics stack and is one of the leading suppliers of middleware that enable 3D graphics to be used in Java games. Ericsson Mobile Platforms are the lead Partner for the Mali-JSR297 software, complementing the Mali200 GPU and ARM graphics middleware in the groundbreaking HSPA-enabled mobile platform, U500, bringing console class gaming to 2009 feature phones. With the ARM Mali-JSR297 software, game developers now have complete control over the visual appearance of their games, enabling the creation of graphics displays on mobile phones that are similar to those seen on high-end gaming consoles and PCs. The Mali-JSR297 software demonstrates a leap in graphics quality that meets consumer demands for advanced-content entertainment on mobile phones. In order for Java applications to make use of the graphics hardware, handset manufacturers require an efficient software engine that minimizes the number of calculations that Java games need to perform in order to display the graphics. The Mali-JSR297 software builds on ARM’s legacy in graphics solutions and eliminates the risk of integration issues. Furthermore, the new features in the Mali-JSR297 software reside beneath the gaming applications that users download to their phones and open up the full power of OpenGL ES 2.0, the API used in leading games consoles such as the Sony PlayStation 3 and which is supported by the Mali200 GPU. The ARM Mali-JSR297 software empowers developers with the artistic freedom to produce games with more personality, despite limited display size, which previously had not been possible for mobile Java applications. The Mali-JSR297 software is the latest addition to the Mali™ graphics stack, a fully integrated set of hardware and software IP that supports all the graphics standards a device manufacturer needs. ARM has further expanded this stack with the recent launch of the Mali-JSR226™, Mali-JSR287™ and Mali-SVG-t™ products for the 2D graphics market at Mobile World Congress in Barcelona, Spain. Please visit http://www.arm.com/news/19869.html for more details. The ARM Mali-JSR297 software will be released immediately following ratification of the JSR297 standard, with pre-release versions available from ARM in Q3 2008. For more information about the ARM graphics stack, please visit: http://www.arm.com/products/esd/multimediagraphics_home.html. ARM designs the technology that lies at the heart of advanced digital products, from wireless, networking and consumer entertainment solutions to imaging, automotive, security and storage devices. ARM’s comprehensive product offering includes 16/32-bit RISC microprocessors, data engines, graphics processors, digital libraries, embedded memories, peripherals, software and development tools, as well as analog functions and high-speed connectivity products. Combined with the company’s broad Partner community, they provide a total system solution that offers a fast, reliable path to market for leading electronics companies. More information on ARM is available at http://www.arm.com. ARM is a registered trademark of ARM Limited. Mali, Mali200, Mali55, Mali-JSR184, Mali-JSR226, Mali-JSR287, Mali-JSR297 and Mali-SVG-t are trademarks of ARM Limited. All other brands or product names are the property of their respective holders. “ARM” is used to represent ARM Holdings plc; its operating company ARM Limited; and the regional subsidiaries: ARM, Inc.; ARM KK; ARM Korea Ltd.; ARM Taiwan Limited; ARM France SAS; ARM Consulting (Shanghai) Co. Ltd.; ARM Belgium N.V.; AXYS Design Automation Inc.; ARM Germany GmbH; ARM Embedded Technologies Pvt. Ltd.; and ARM Norway, AS. (AP) — Electronic Arts Inc. is pushing ahead with a bid to take over upstart gaming rival Take-Two Interactive Software Inc., despite rebuffs from the smaller company. EA said in a statement Sunday that it was making an all-cash bid of $26 per share, or about $2 billion, for New York-based Take-Two, known for its “Grand Theft Auto” franchise. EA, the world’s largest independent video game publisher, said it was releasing details of the proposal to get the attention of Take-Two shareholders after Take-Two’s board turned down its second bid in two weeks. The offer represents a 64 percent premium over Take-Two’s closing stock price of $15.83 on Feb. 15, the last trading day before Redwood City-based EA made its proposal. Take-Two shares closed at $17.36 Friday. “There can be no certainty that in the future EA or any other buyer would pay the same high premium we are offering today,” EA Chief Executive John Riccitiello wrote in a letter to Take-Two released Sunday. Riccitiello added that Take-Two’s quick acceptance of the offer would mean EA could put its marketing muscle behind the eagerly awaited release of “Grand Theft Auto IV,” set for April 29. In its response, Take-Two called the EA offer a “highly opportunistic” attempt to take advantage of the game’s upcoming release. “Electronic Arts’ proposal provides insufficient value to our shareholders and comes at absolutely the wrong time,” Take-Two chairman Strauss Zelnick said in a statement Sunday. Zelnick said EA rejected Take-Two’s offer to resume discussions of the takeover bid the day after “Grand Theft Auto IV” hit store shelves. EA said it offered $26 per share Tuesday after Take-Two rejected a $25-per-share bid earlier this month. The offer comes as Take-Two works to regroup following a rocky year. Shareholders threw out most of the company’s top leadership last spring over poor results as well as accounting troubles and controversy surrounding violent and sexual content in the company’s games. Several former Take-Two executives, including Chairman and CEO Ryan A. Brant, pleaded guilty in 2007 to falsifying business records in connection with a probe into backdated stock options. Also last year, the British Board of Film Classification refused to certify “Manhunt 2,” a gory game which received an Adults-Only rating from the Entertainment Software Rating Board in the U.S.
EA, which publishes the “Madden NFL” and “FIFA Soccer” series among its popular sports franchises, has been working recently to beef up its product lineup with a wider variety of titles. In January, the company closed its acquisitions of BioWare Corp. and Pandemic Studios, known for their action, adventure and role-playing games, in an $860 million deal, the largest in EA’s history. Earlier this month, the company announced that “Spore,” the highly anticipated game from “Sims” creator Will Wright, will go on sale on the weekend of Sept. 7 amid likely stiffer competition in the $18 billion video game market. In a deal expected to close in the first half of this year, French media and telecom giant Vivendi SA plans to combine EA’s chief rival, Activision Inc., with its own games unit to form Activision Blizzard. The merged company will own the wildly popular online game “World of Warcraft” and the “Guitar Hero” franchise. (AP) — The company behind the hugely popular video game “Grand Theft Auto” says it is not going to jump at a $2 billion buyout offer from Electronic Arts Inc. The offer is “the wrong price at the wrong time,” Take-Two Interactive Software Inc. chief executive Ben Feder said Monday after the news of the $26-per-share bid sent Take-Two’s shares up 55 percent to a $26.89 close. Electronic Arts is undervaluing Take-Two and not factoring in the benefits of its recent turnaround efforts, Feder said in an interview. Take-Two said it is open to discussions with EA, but wants to wait until April 30, the day after the latest version of Grand Theft Auto hits store shelves. But analysts said Take-Two may not have the luxury of time. While Take-Two wants a higher price, EA could make this bid hostile, or walk away and come back with a lower offer, they said. “There can be no certainty that in the future EA or any other buyer would pay the premium we are proposing today,” EA’s CEO John Riccitiello said during a conference call. GTA has sold more than 65 million copies in the decade since the first game in the series, where players complete gritty crime missions to rise to the top. Take-Two called the timing of EA’s unsolicited offer “opportunistic” because it is so close to the launch date of the new version of GTA. Redwood City, Calif.-based EA says it wants to act now so that it can get its marketing muscle behind GTA before the holiday season, when video game companies make most of their money. EA’s offer represents a 64 percent premium over Take-Two’s closing stock price of $15.83 on Feb. 15, the last trading day before the company made its latest proposal, privately, to Take-Two. EA, which said it has been in talks with Take-Two on and off for about a year, offered $26 per share on Tuesday, Feb. 19, after Take-Two rejected a $25-per-share bid on Feb. 15. EA went public with the higher bid on Sunday. While much of Wall Street’s and gamers’ focus Monday was on Grand Theft Auto, Michael Pachter, an analyst with Wedbush Morgan Securities, said it’s Take-Two’s sports business that’s the most lucrative for EA. EA, which owns the Madden NFL and FIFA Soccer franchises, would round out its holdings with Take-Two’s baseball, basketball and hockey titles to dominate the sports game arena. Even if EA wins Take-Two, it isn’t clear whether the brothers who helped create “Grand Theft Auto” will stay on. Sam and Dan Houser, who lead Take-Two’s Rockstar Games label, are under contract with the company only until next year. Sam Houser could not be reached for comment Monday and Take-Two would not comment on what it said was a confidential matter. Thill said, however, he thinks there is “considerable value” for a development studio to tap into EA’s financial, marketing and distribution resources. Josh Resnick the co-founder and general manager of Pandemic Studios, which EA recently acquired along with BioWare Corp. for $860 million, agreed. He said Riccitiello quickly allayed concerns about the studio being able to maintain creative control and independence. “John is one of those rare executives in the games industry who really gets it” he said. In an interesting twist, Take-Two amended its management contract with ZelnickMedia Corp. on Feb. 14, a day before it privately rejected EA’s first offer. Feder and Chairman Strauss Zelnick are ZelnickMedia’s founding partners. The changes, which Take-Two disclosed in a filing with the Securities and Exchange Commission, increase the monthly management fee paid to ZelnickMedia to $208,333 from $62,500 and raise the maximum annual bonus ZelnickMedia can receive to $2.5 million from $750,000. Take-Two’s board also granted 600,000 in restricted shares to ZelnickMedia that will vest in equal installments over three years. But if the management contract is terminated or if there is a “change in control” of the company, that is, if Take-Two is bought out, the stock awards vest “in full immediately” before such a change takes place, Take-Two said in the regulatory filing dated Feb. 14. Feder and Zelnick took Take-Two’s helm last year after a March shareholder coup ousted most of the company’s top executives and board members over poor results, accounting troubles and controversy surrounding violent and sexual content in the company’s games. Shares of Electronic Arts fell $2.60, or 5.2 percent, to close at $47.14. 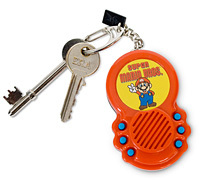 If you’re a fan of Super Mario Bros then this is the keychain for you. This nifty little handheld gizmo is preloaded with six classic sounds from the greatest side-scroller in history. Simply press a button and you’ll be transported back to the Mushroom Kingdom faster than you can say ‘Mamma mia, dezza King Koopa widda da Princess Toadstool.’ There are six incredibly evocative sounds, including, Big, Coin, 1Up, Jump, Start and Ouch. Available from Firebox for £7.95 (~$15).